Hanging candle holders are a fun way to bring candles to any spot in your home. They're a particularly pretty choice, even if you never light the candles, in a hallway or another spot that you want to make a little more cozy looking. There are many different varieties of hanging candle holders available. Chandelier-style hanging candelabras could replace a light fixture and would look romantic hanging above a piano or in the corner of a library or sitting room. Hanging lanterns give the look of a traditional carriage light or lantern. 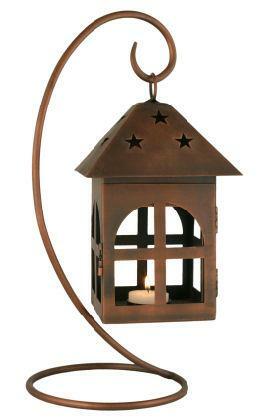 Tabletop hanging candle holders bring the look of a lantern to any surface; candle lamps also sometimes fall into this category. There are votive holders that you can hang from a tree. Traditional and modern sconces allow you to literally put a candle or two on the wall the light the way down a hall or lend a romantic look to a sitting area in your master bedroom. Once you start thinking about decorating with hanging candle holders, you'll come up with all sorts of places you want to use them. There are many different places that you can buy candle holders to hang on the wall of other holders that hang as described above. Your local craft store may have some inexpensive options. Most home décor stores that sell candles will also have some kind of hanging holders for sale. Stores that specialize in candles, such as the Yankee Candle shops, might also have these types of candle holders available for purchase. Wild Things has a variety of chandelier-style candle holders, as well as other holders that hang from the ceiling or on the wall, or that can sit on a tabletop, such as a decorative tree with candle holders hanging from it. Checking out the shops on BizRate will show you a ton of options, from carriage style lamps to a variety of great wall sconces. Another way you can hang candles in your home is by making your own hanging candles. This can be done with a glass jar and some heavy wire. Wrap wire around the top (just under the lip) of the jar. Use pliers to attach wires on each side of the jar, connecting to the wire you just wrapped around the jar and to each other at the top. This will give you a way to hang the candle holder, which you can fill with a votive or tea light if you used a baby food size jar or a bigger candle if you used a mason jar. Remember that heavier candles and jars will need more support, so use a heavy-weight wire. Let the candle hang for a little while before lighting to make sure the wire will support the weight of the holder. These types of candle holders are great to use outside to decorate a garden party or to keep mosquitoes at bay if you burn citronella candles in them. They can be attached to a garden hook, put on a nail secured to a wall or tree, or even hung from the tree itself. Always be careful when burning candles outside not to put them too close to something flammable and never leave them burning unattended.